Yashodhara, whose blogs I often read silently, is out with a book with the above quoted title and she's now up with a contest for we bloggers. And since I've been itching to pen something on this blog for quite sometime, I guess rejigging some old memories would result in no harm! This was just a week after our wedding after all the requisite customs were done with. We finally got the green signal for our honeymoon. I was pretty much sure I did not want to go abroad for one, as there were so many places to discover in this magnificient country of ours. And well - on a honeymoon - sight-seeing is best done indoors! So Simla it was. And being December, it would be lovely cozying up in the chill! Being a railway fanatic, I wanted to book up a First AC coupe on a Rajdhani, but the idea of a 24 hour journey on train was vehemently and unceremoniously vetoed and so I think we flew Indigo from Hyderabad to Delhi. 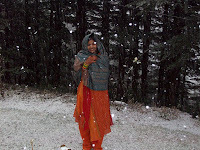 The better half was in a good mood, having gotten over the million rituals and away from the maddening crowd. The fact that I consciously prevented my eyes from darting towards the air-hostesses helped. The two hour flight was spent in whispering sweet nothings and getting her toe-ring jewelry off the feet and into the hand bag! Wifey never was nor is a fan of road journeys. And that helped the railfan in me. 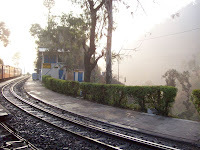 She agreed to travel from Delhi to Kalka by a regular train and of course she easily agreed to do the scenic Kalka-Simla Narrow guage train run by the Shivalik Deluxe! When I entered the Old Delhi railway station for the first time, I pinched myself and confirmed that I was still on earth and not yet in hell. I could just imagine what wifey was going through. Anways, we waded past the fish-market that the station had become and finally reached the spot where our train was supposed to land up! 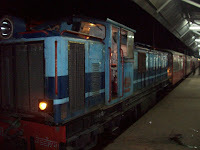 Now, we were booked up on the overnight run of the Kalka Mail that would its way from Howrah to Delhi. This train is a treat for a railfan what with its multiple change-of-configurations and loco changes. It arrived with a dirty red Howrah WAP-4 loco and I was disappointed. I was expecting the state-of-art brand new white monster WAP-7 loco that had been recently added to the Indian Railway's fleet. 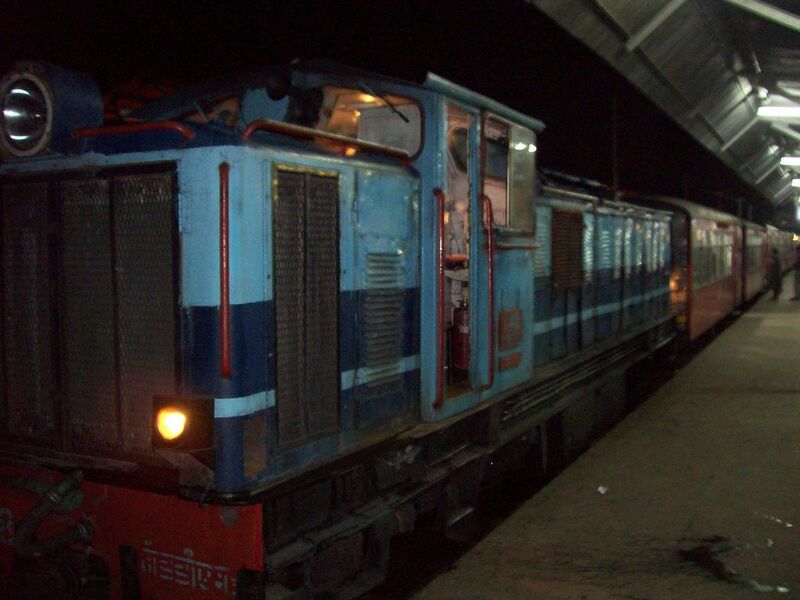 The loco was allotted to sheds in North and East India initially and I'd never ever seen one with my eyes down south. I took the disappointment of not having that loco with a positive view of getting to have more of wifey in my thoughts than the loco and boarded the train with a smile. Wifey had strictly instructed me not to leave her for a minute and since I did not want to disappoint her, I made myself forget that I was a railway enthusiast. We chatted till late in the night and then dozed off. We were a little late when we reached Kalka, but there was more than half an hour left for Shivalik's departure. Just when we had disembarked from the Mail, came the melodious tones of the loco. It was not a sound I was familiar with. It was a new loco. And there I spot it.. a white loco at the head of the rake. Wifey, wait a minute; and off I ran with my camera and immersed myself in the pleasure of having seen my first WAP-7 loco when there was another short tweet from across the platforms! Ah, the puny little sky blue ZDM-4 which was to haul our Shivalik to Simla! I returned to the wife to find a different woman there. Smile on face and twinkle in the eye replaced by frown on face and anger in the eye! The love was left on the broad guage track and the sulk had joined us on our journey up the narrow! Lips sealed, smoke bellowing from the ears, killer looks from the eyes was what wifey threw at me. I must have said a thousand sorrys as the Shivalik wound its way through the pine covered hills and dark tunnels. The night lamps were going off as the day broke and the sun shone ever so lightly onto the large windows of the D4 coach of the Shivalik. 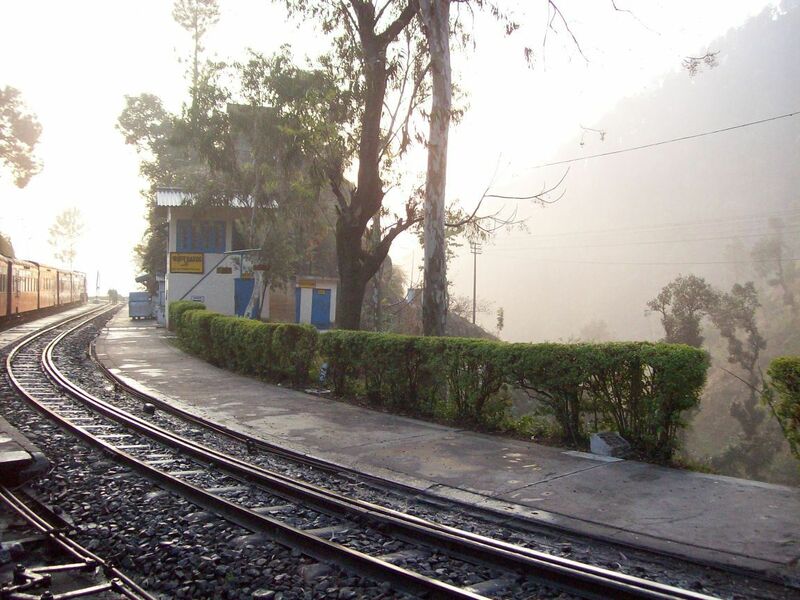 The Shivalik has only one halt on its entire run and that is at Barog, a wonderful station! The weather was brilliantly bright and it was extremely cold. Then they served hot breakfast on the train. That did the trick and the frown returned to her bag and the smile came out! Simla provided us another great treat. 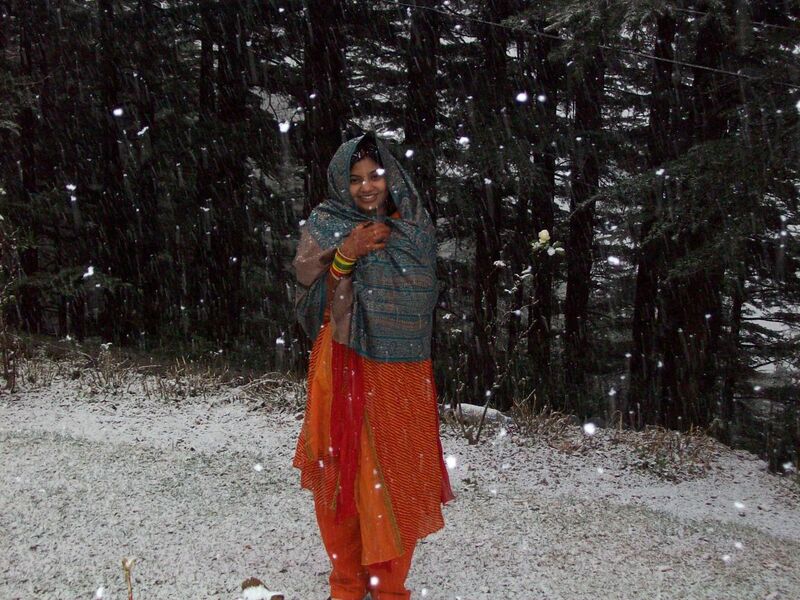 It received its first snowfall of the season the day we reached! Wifey still freaks out when reminded of this incident! She says that I left a newly wed wife for an hour and went away somewhere! A lil exaggeration is fine I guess, if it brings a smile on her face. Please excuse, I was just married. 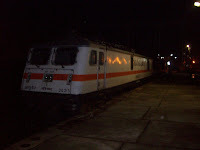 But been a railfan since years! Ha ha.. I must have left her for 5 mins at the most! And yes, these days I'm a Wifeslaving railfan ! Lol This is so funny..I can totally imagine your wife's anger.. Husband runs with a camera behind a loco ;) when there is a beautiful lady standing next to him! !..You better be careful next time..
Yeah, but what to do? Habits die hard. And well, I've toned down my instincts when I'm with her! Cute entry :)...thanks for participating! Lol Vrij...good one! Been long since we read a trip report from your end! The two hour flight was spent in whispering sweet nothings and getting her toe-ring jewelry off the feet and into the hand bag!